Israeli environmentalists say an unconventional nature park they recently opened in Jerusalem can be a model for how to sustain wildlife in urban settings - while also helping the human animals nearby. Surrounded by highways and residential neighborhoods, a small flock of endangered mountain gazelles roams a large grassy field lined with trees and a series of artificial ponds. The gazelle, an animal dear to many Israelis' hearts, shares the habitat with turtles, toads, chameleons and a variety of birds. Gazelle Valley Park opened in March in the western part of the city, but the park is not a "reserve" in which nature "gets the right of way," said Amir Balaban of the Society for the Protection of Nature in Israel (SPNI), one of the groups that launched the free public park. "We have to think of it as a community urban wildlife site in which people and wildlife interact," he told VOA in a recent interview in the valley. "The novelty of this place is that the community takes an active part in the management of the herd and the habitat." It was a long and collaborative effort to get the project going. Balaban's SPNI was part of a 20-year campaign by community residents, rights activists and environmentalists who initially joined forces to block a residential and industrial building plan for the valley in the late 1990s. The proposed construction threatened not only to destroy the gazelles' habitat, but also to cut off the residents' access to the valley's green spaces. After persuading Jerusalem municipal authorities to reject the development plan in the early 2000s, the coalition of activists drew up its own plan to preserve the valley as a park. In 2008, the community proposal won the approval of Jerusalem's then-newly inaugurated mayor Nir Barkat, whose office later raised $5 million for the project. One of the most active Gazelle Valley campaigners was Michal Regev, who lives across the street in the Katamon neighborhood. "As far as I know, this is the first case in Israel in which simple people - the citizens - were given a mandate by the authorities, who said, 'Give us an alternative proposal that we can accept.'" Balaban said the winning plan - Gazelle Valley Park - was the largest project that his non-profit group SPNI has undertaken in an Israeli city. "If this succeeds, there will be many more. But if we fail, it might be the last one." He said SPNI was working with the Israeli government to plan a national network of urban wildlife sites that would educate city residents to protect and enhance local biodiversity - a model he believed could be replicated in other parts of the world. "Looking around us, there is a lot of urban wildlife along the Nile, which passes through Egypt’s capital, and in the Iraqi capital, Baghdad, along the Euphrates," said Balaban. "These cities have a lot to gain from working with nature. But if you try to erase nature, it will have its revenge on us. We see that if we wreck salt marshes, coastal cities are flooded. And if desertification happens in Mediterranean cities, we suffer from climate change," he added. Embracing nature is what about 100,000 visitors have done at Gazelle Valley Park in its first three months, according to SPNI. And the mingling isn’t confined to just wildlife. "You see people from very different backgrounds spending time in one place," said Balaban. "You see ultra-religious Jews, ultra-secular Jews and Arabs just enjoying nature, doing their own thing, but with a lot of patience." 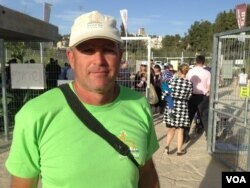 Orthodox Jewish Israeli Raphoel Wolpin recently visited the park for the first time with his wife and children. "Jerusalem is a city with a diverse population," he said. "Here you see Jerusalem at its best." The Palestinian government in the Israeli-occupied West Bank is skeptical about the Israeli urban wildlife project. "We are not against [Israelis and Palestinians] learning together [about nature], as we are condemned to live together," said the government's communications adviser Xavier Abu Eid, in a statement to VOA. But Abu Eid noted that unlike Israeli Arabs and Palestinian residents of East Jerusalem, many West Bank Palestinians such as himself could not reach Gazelle Valley Park because the Israeli military denied them travel permits. He also labeled Israel a hypocrite, saying it claimed to support nature while "destroying" Palestinian natural resources through Jewish settlement activity in the West Bank. Abu Eid said Palestinians have seen their trees uprooted and their water resources and access to green areas taken away. "So we are against any Israeli initiative that aims to beautify the current reality of apartheid and occupation of Palestinians," he said. While the Palestinian government criticizes Israel's environmental record, some Palestinian environmentalists take a more positive view of the new Israeli park. "It is a good achievement by Israeli activists in mobilizing civil society to be engaged with wildlife and diversity," said Faisal Zakarneh of the Jenin-based Green Life Association. Speaking to VOA by phone, Zakarneh said his group has proposed similar rehabilitation of West Bank nature sites. But, he accused Israel's bureaucracy of thwarting those plans for political reasons and called for a political response. "It is a long process to get permits and finally you get nothing because Israel says your proposals threaten the security of the Israeli military, settlements or bypass roads. If you have an independent Palestinian state, you could do lots of environmental things here," he said. The Israeli government agency that administers much of the West Bank, COGAT, responded to the Palestinian criticisms by saying that it actively promoted green projects suggested by Palestinian bodies in autonomous West Bank areas. "Both sides have a common interest in the welfare of the areas' Palestinian population," COGAT said in an e-mail to VOA. It said it accepted a request from Palestinian authorities to support a World Bank project to rehabilitate 105 dump sites in the northern West Bank in the 2000s. World Bank environmental engineer Farouk Banna inspected the "Zahrat al Finjan" waste management project last year and described it as "impressive." In a blog post he said he was "inspired by how various local governments were cooperating despite the volatile political environment." Israeli environmentalist Balaban said another nature site he helped to create in 1994, the Jerusalem Bird Observatory, also has been a vehicle for Arab-Israeli cooperation. He said U.S. government aid agency USAID helped the observatory to hold the first joint training course for Israeli, Palestinian and Jordanian conservationists. "Maybe I'm naive, but I believe that nature is very soothing and the best common denominator. And I'm not the only one," said Balaban.